Putting smart small bathroom design ideas front and center will help a pint-sized space feel a little more palatial. Clever small bathroom design ideas are key to creating functional spaces that aren’t total eyesores. Anyone who has struggled to make a tiny bathroom work, especially if it’s a shared bathroom, knows how much more difficult it is if the room hasn’t been designed with efficient bathroom shelf ideas and other smart small bathroom storage solutions, no matter how pretty that bathroom backsplash is. 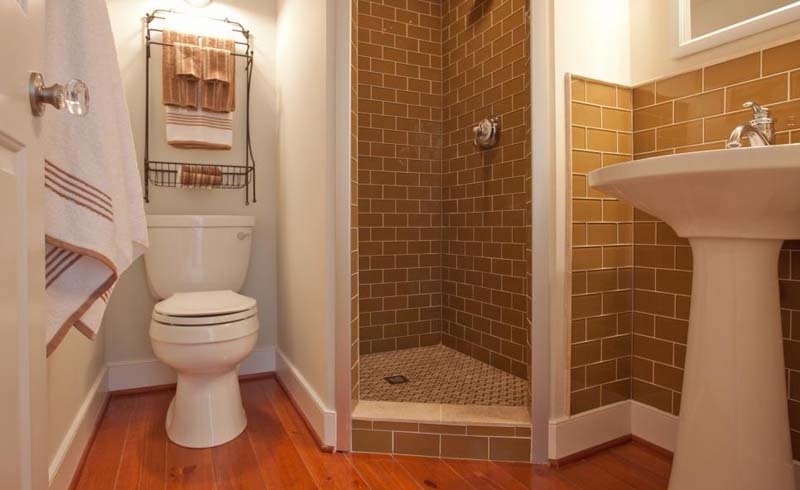 On the flip side, no one’s going to enjoy a bathroom that’s effectively designed but visually unattractive. Fortunately for everyone who values functionality and fine appearances (so everyone, really), some small bathroom design ideas actually do both, and the design team at bathroom renovation company Block knows them all. When it’s time to start planning that small bathroom remodel, make the most of a small bathroom with their expert-approved design ideas. Some of the Block team’s smart small bathroom design ideas introduce unexpected multitaskers to a space to add more storage, reduce visual clutter, and more, while other tricks add the large-scale personality that so rarely fits into small spaces. With these small bathroom secrets, making the best of limited space doesn’t mean sacrificing function or style. Storage methods the Block team calls decorative but functional—think hoteliers, hand towel shelves, shallow floating picture ledges, and robe hooks (for towels and hanging baskets alike)—maximize wall and door space for storage while looking nice, not clunky or unintentional. Incorporating necessary lighting features with other bathroom design elements reduces the visual clutter in a small bathroom. The Block team suggests using large, mirrored medicine cabinets with integrated light, which give the impression of a larger bathroom while maximizing storage and function. Some medicine cabinets even have outlets inside for charging toothbrushes, razors, and more, further reducing visible clutter. A variety of materials and colors in a small space creates depth, which can help balance out other elements in the room. A darker floor grounds the room, especially if there’s a bright wall color, and makes the vanity—whether it’s a floating vanity or not—the focal element. White textured walls can also help create more depth and mimic the feeling of a larger space, the Block team says. 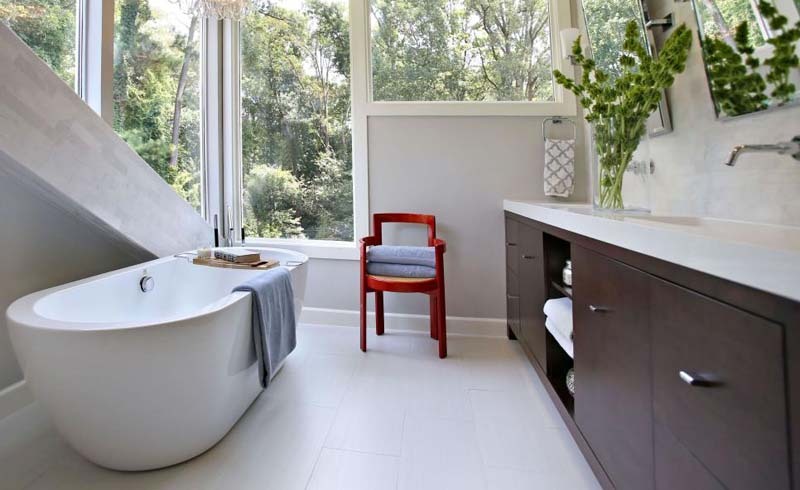 Some eye-grabbing bathroom design ideas take up a lot of space—looking at you, soaking tubs and waterfall showers. In a small bathroom, making similar design statements requires a more subtle touch, such as personalizing timeless (and affordable) features such as subway tile by turning it vertically for a modern twist or attempting other unexpected bathroom tile ideas. For another method of creating a drastic or subtle pattern, the Block team suggests using dark or light grout (depending on the desired look) and a unique tile layout. A little visual drama isn’t restricted to just large bathrooms. The Block team says accenting one wall with paint or tile offers a lasting, high-impact impression without taking over the room (or the renovation budget).